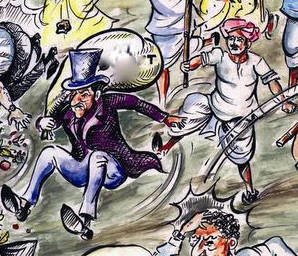 On 9 August 2011, a date marked every year as ‘Quit India Day’ for its association with a landmark in India’s freedom movement, thousands of Indians marched to support food and seed sovereignty. From remote tribal hamlets in Orissa to cities like Mumbai and New Delhi, more than a hundred events were organised by civil society groups and concerned individuals to highlight the issues of food, farmers and agricultural freedom. 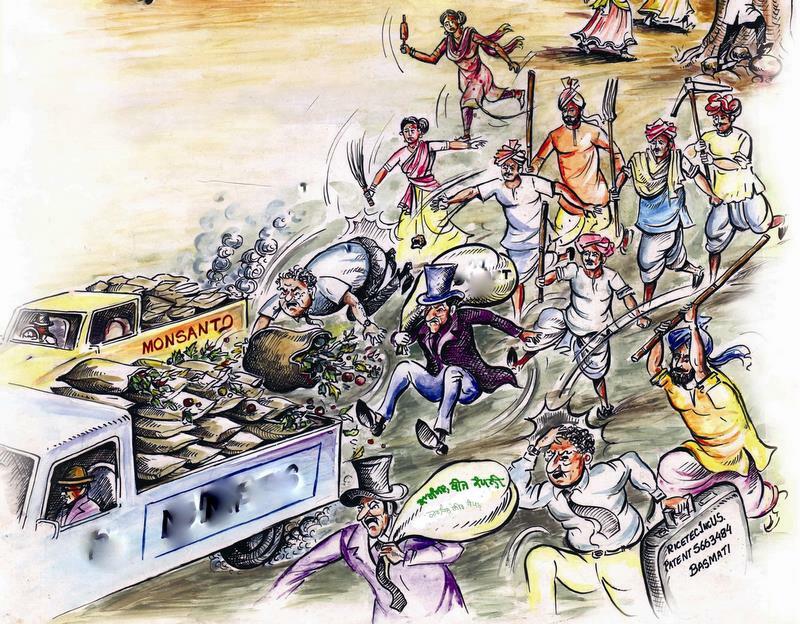 The ‘Monsanto, Quit India!’ day call was given by the Alliance for Sustainable and Holistic Agriculture (ASHA), a national network of more than 400 organisations working to promote sustainable farm livelihoods, seed and food sovereignty, food safety, farmers’ and consumers’ rights etc. 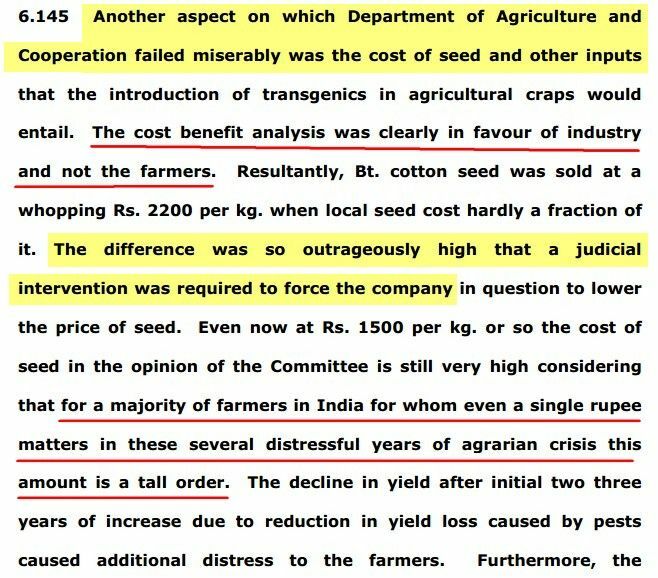 Across the country, the demands made to central and state governments were four-fold: no collaborative research partnerships with companies like Monsanto in the state agriculture universities and other institutions in the NARS; no commissioned projects especially for GM crop trials, by these institutions and no GM crop trials in general; no public-private-partnerships (PPP) in the name of improving productivity especially of crops like maize and rice which in effect pose serious questions on food/nutrition security as well as seed sovereignty; setting up grassroots systems of seed-self reliance, recognising farmers’ skills and knowledge related to seed and supporting institution-building and infrastructure around such self-reliant systems, so that timely availability of appropriate, diverse, affordable seed for all farmers is possible. In Mumbai, farmers from the Vidarbha region of Maharashtra state joined hands with Mumbai citizens to narrate stories about GM seeds like Bt cotton and how suicides by farmers continue to take place because of debt related to high inputs and crop failures. In Mumbai, youth joined freedom fighters in a silent march from the Lokmanya Tilak Statue in Chowpatty to the historic August Kranti Maidan. 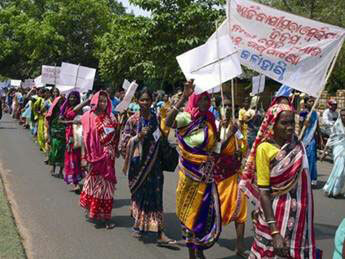 In Orissa, padayatras and palli sabhas marked the day with dialogues with farmers in the tribal regions where the government is promoting hybrid maize along with chosen corporations, activists and farmers leaders urged farmers not to fall prey to the false promises and short-term yield claims of these corporations. In Andhra Pradesh, all major farmers’ unions along with dozens of civil society groups came together to urge the state government not to allow any GM crop trials in the state. 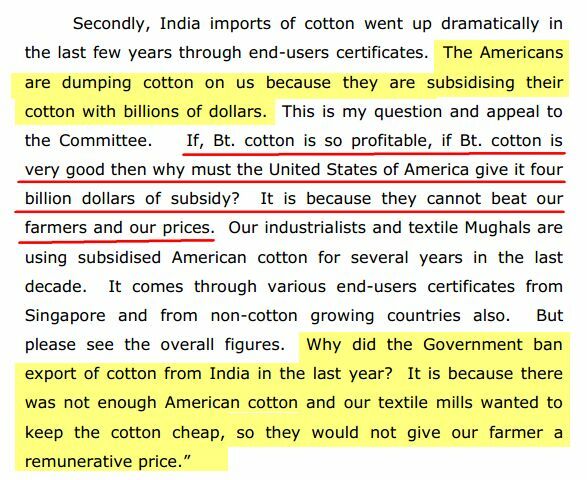 They reminded the state government that corporations like Monsanto (and its associates) have not hesitated to defy the government on various issues including redressal for loss-incurring farmers and price reduction on cotton seeds. A delegation met with senior bureaucrats in the Department of Agriculture after a protest sit-in at the Agri-Commissioner’s office. Bangalore in the state of Karnataka witnessed a gathering of 300 farmers and consumers under the leadership of Kodihalli Chandrasekhar, President, Karnataka Rajya Raitha Sangha (KRRS) who held a demonstration at the Directorate of Agriculture. One of the main points raised here was related to state agencies like the University of Agricultural Sciences-Dharwad facilitating biopiracy in the name of collaborative research. 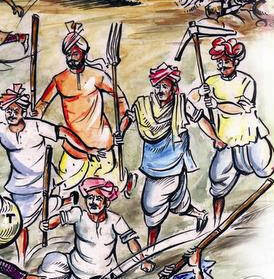 Protesters demanded the scrapping of the ABSP II project through which Bt brinjal varieties were created posing serious questions on the IPRs over farmers’ seed resources; they also demanded that agencies which have violated the legal provisions of the Biological Diversity Act be penalised for such violations. The protestors dispersed only after receiving an assurance from top bureaucrats sent by the Agriculture Minister, that all partnerships and collaborative projects with Monsanto and other such companies will be reviewed. In Patna, in the state of Bihar, freedom fighters and social activists along with farmers’ leaders joined hands to take up a one day symbolic fast against the government’s partnerships with Monsanto and research on GM crops like Golden Rice. The activists were met by the Minister for Agriculture and Minister for Food and Civil Supplies and an assurance provided that Bihar government would look into all the issues raised with regard to hybrid rice, hybrid maize, Golden Rice etc. 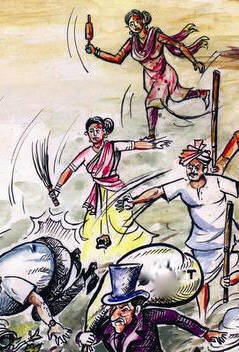 More than 15 events marked the day in Tamil Nadu state. 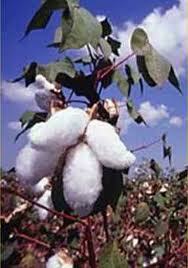 In Coimbatore farmers and acitivists urged the state government not to allow the State Agriculture University to take up GM crop trials. 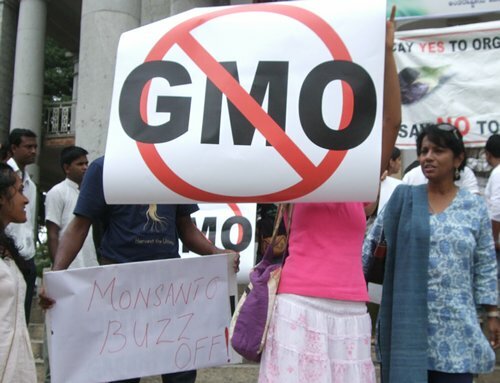 They reminded the ruling party in Tamil Nadu about its election manifesto in 2009, where AIADMK had expressly recognised the threat from GM seeds and their unsuitability for Indian conditions, wherein the party had promised ‘no more promotion of GM seeds’. Memoranda submitted to the Chief Minister from various locations across the state urged her to follow the footsteps of other progressive states, which have taken a firm stand in favor of farmers and environmental sustainability and have said NO to GM crops. 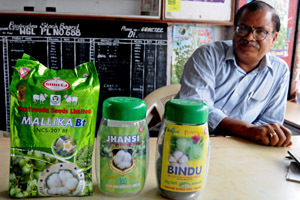 Data was shared from official records on the occasion to show that Bt cotton had not made any dent to the insecticides use in cotton in the state and that yields have been fluctuating greatly over the years that Bt cotton expanded in the state. In Madhya Pradesh, hundreds of protesters gathered in Neelam Park in Bhopal from all over the state and took out a funeral procession of Monsanto and cremated Monsanto symbolically. They pointed out that the promotion of hybrid maize seed would nullify the efforts of the state government in promoting organic farming in the state, with an organic farming policy being officially adopted recently here. 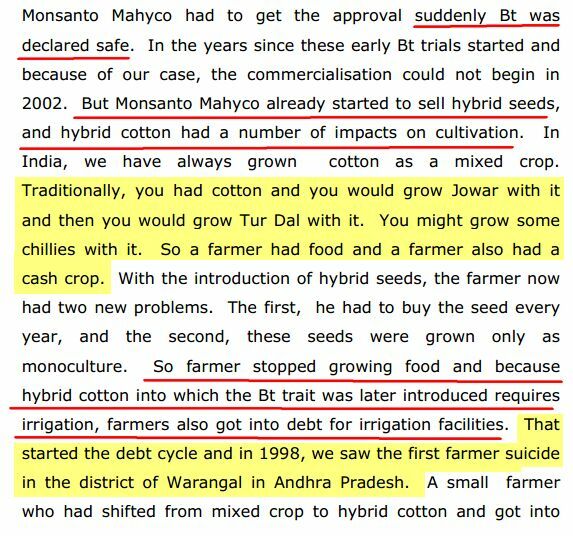 Protesters said that hybrid maize PPPs with corporations like Monsanto will take away diversity from our farms, will jeopardize food and nutrition security of poor tribals, will bring in agri-chemicals and indebtedness and will push the farmers of the state towards more suicides. Punjab saw the launch of a week-long unique ‘Kheti Khuraak Azaadi Jatha’ from Jallianwala Bagh on the occasion. This Jatha will travel through the villages and towns of Punjab in the coming days and highlight the dangers of the recent secret deal that the Punjab government entered into with Monsanto. Farmers unions and activists here cautioned the government against giving a No Objection Certificate to GM crop trials in the state and said that all political parties have to take cognizance of the opposition amongst citizens against GMOs in our food and farming, as Punjab moves towards Assembly elections next year. In Gujarat, a Beej [seed] Yatra in the tribal pockets of the state preceded the August 9th events; in Baroda, many Gandhians, along with housewives, youth and activists, took out a rally across the city today, despite heavy rains. In Uttar Pradesh, led by Bhartiya Kisan Union’s Rakesh Tikait, a fiveday long mobilization effort began with a farmers’ meeting held in Muzaffarnagar. The UP government was urged not to allow any GM crop trials in the state and to revise its plans for hybrid maize and hybrid rice promotion.